Old Crossleyans v Driffield. Chris Vine. Old Crossleyans remain fourth from bottom of Yorkshire One in spite of being crushed 58-7 at home by leaders Bradford and Bingley. 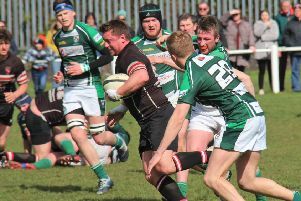 Yarnbury picked up a losing bonus point at Malton & Norton to trim Crocs’ lead over them to two points while Selby beat West Park Leeds 19-12 in the scrap between the bottom two. The Broomfield game was virtually over as a contest after 25 minutes with the Bees storming into a 27-0 lead. Centre Taylor Fiddes opened the scoring after seven minutes and South African stand-off Gerhard Nortier converted and added a 10th minute penalty. It was largely one-way traffic as winger Nick Gore, ex-Crocs fullback Ben Greaves and Nortier touched down to put more daylight between the teams. Crocs started to recover with half-backs Will Travis and Zane Sanders to the fore and the visitors were unable to add to their tally until added time in the first half when Nortier touched down and converted to make it 0-34. The only points in the first 30 minutes of the second period went to Crocs. They came on 50 minutes when fullback Gareth Sweeney collected a kick on his own 22 and broke through the Bees defence on half-way. The home side won a penalty 15 metres out and captain Chris Vine caught the visitors napping and went under the posts, Ryan Sweeney converting. Crocs continued to resist in spite of injuries to Travis and Sanders which caused a reshuffle. Romanian Ginel Lupescu came on at stand off and helped ease pressure with long clearances. Bees had a try ruled out and then home centre Jack Hammond was ruled not to have grounded the ball properly over the line from his kick through. A Nortier penalty launched a Bees points spree in the final 10 minutes. Fiddes got his second try, substitute Michael Crotch got on the scoresheet and the visitors then went the length of the field with winger Adam Mitchell completing another unhappy afternoon for Crocs.